Stand (*an Autumn play) at Five Myles Gallery in Prospect Heights, through Sunday, May 15. “That play was like Samuel Becket, but, it was all about emotion,” he said. “Guilt,” he finished for me. “Guilt! Yes, and fear and love. It had so many dimensions of the barriers in relationships. Not because she was actually dead in the play. I like how it was interactive,” I said. “Becket’s idea is that we’re always alone, even when we’re together. Her idea was that we’re always together, even when apart,” he said. My boyfriend Jed and I just left the opening night for Stand (*an autumn play), an experimental theater piece, at Five Myles Gallery in Prospect Heights (through Sunday, May 15, 8 p.m.). We’re on our way to the Vanderbilt for hors d’oeuvres and drinks with the cast, an event planned for every night after the show. Stand was written by Mary Laws and directed by Michael Stablein Jr., owner of the The American Laboratory theater company. “Stand is our most narrative play. We’re interested in the point in which language is still integral yet banal. We try to create multi-sensory installations where people walk away with several different narratives depending on their perspective,” Michael said. 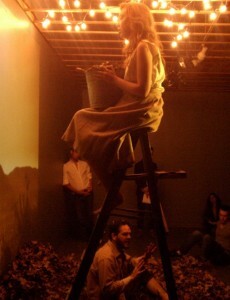 Held in an open warehouse gallery, Stand has two actors, seated in a plastic rectangle full of leaves. The male sits on the ground; the female, on top of a ladder. The audience is encouraged to walk around, sit, stand and examine. The play is 30 minutes long. For me, the production captured the looping nature of emotion. Have you ever tried to convey a feeling to an audience or a stranger? Did it seem contrived and heavy handed? Stand felt original and unpretentious. Interactive art does wonders for the senses. I’m serious. 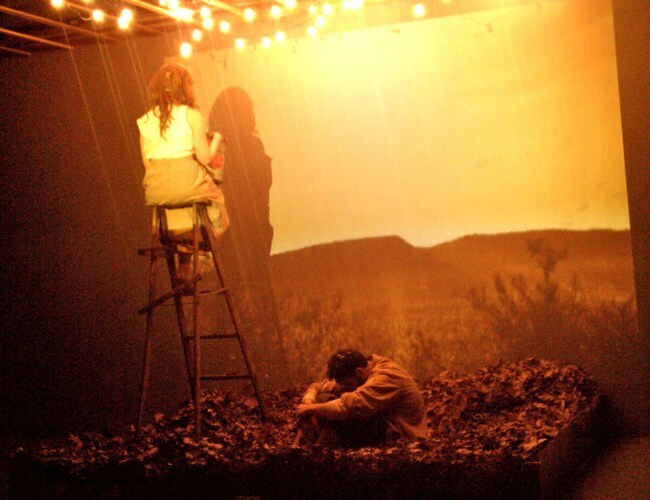 The play opens with a monologue and continues, in an elliptical schizophrenic sort of way, at times leaving the viewer somewhat frustrated, bored and skeptical. Then it brings you back and makes you appreciate all the lulls in rhythm. I think life is sort of like that. It’s not that we don’t want to talk to the drunk at the bar, we just don’t want to be disappointed with the realization that he is in fact just drunk and not profoundly depressed, waiting to be chipped away and uncovered. Stand opens us up: Go ahead, talk to the drunk at the bar. See what he has to say. At the end, Stand leaves us with meaning, and feeling. Spend the $10 for admission. It’s worth it. Two for one drinks and free hors d’oeuvres at Vanderbilt Bar afterward.